The California Bureau of Cannabis Control is asking that nearly 850 batches tested by Sacramento-based Sequoia Analytical Labs be either destroyed or re-tested. Sequoia Labs surrendered their testing license in late November after state officials discovered that their lab director, Marc Foster, had been falsifying test results. Sequoia is required by law to check for 66 pesticides and Foster was passing samples that had not been tested for 22 of those pesticides. 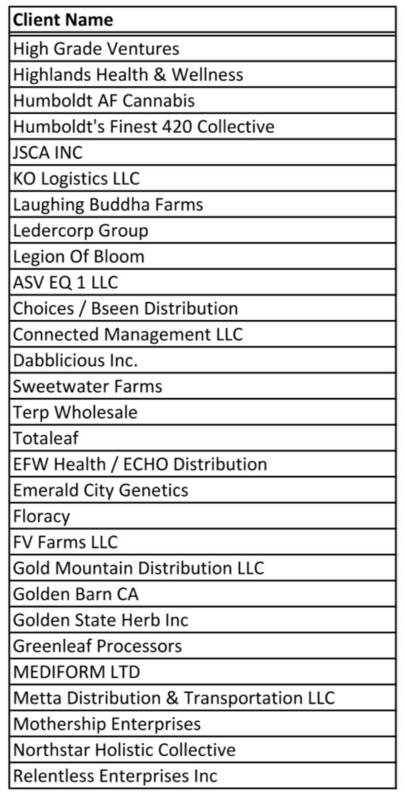 If you have sold batches that were tested for regulatory compliance by Sequoia Analytical Labs after June 30, 2018, please contact all consumers who purchased cannabis goods from these batches and allow consumers to return the cannabis goods. All cannabis goods returned by customers or remaining in your inventory from these batches, must be destroyed, or returned to the distributor from whom the batch was received. For cannabis goods remaining in your inventory, a licensed distributor may arrange for the remaining portions of the batches to be re-sampled and re-tested to determine if the cannabis goods can be sold. Marijuana products go through several stages of testing for research and development purposes as well as for their certificate of analysis, which allows the product to be sold. "When these tests are not performed accurately, you're endangering consumers," says Tony Daniel, the chief revenue officer at the Berkeley-based Steep Hill Labs. "In the broader sense, you're undermining this nascent industry that's just getting off the ground." Golden Barn CA co-founder Brendan McKee says he and another co-founder were on their way to Sequoia to deliver a sample for certificate of analysis testing when the Bureau of Cannabis Control shut down the lab. "We were one of the fortunate people who were just doing R&D testing with them at that time," he said. The recall could have a drastic financial impact on marijuana companies, who will have to pay for the loss of product or to have it re-tested. "I think obviously there's a financial burden with having to pay for the re-test of our products," says Sophia Herrera, the director of compliance for Connected Cannabis Co., which had over 100 products impacted by the recall. "Fortunately, [Sequoia Labs] has offered to connect us with their insurance to recoup some of those fees." According to McKee, the shutdown of the lab will also hurt an industry that's struggling to find enough labs to accommodate California's rigid guidelines. There are just 52 licensed labs and almost 1,000 distributors, all of which must get tested before their products can go out to consumers. "There's 7,000-plus cultivation licenses that have already been given out," he said. "There's a need for way more testing, so it'll be interesting to see how the industry handles that in 2019." State regulators don't know for sure whether or not the products contain any of these pesticides, but have recalled them as a cautionary measure. However, McKee points out that if you smoked any pot prior to its legalization, it likely had pesticides in it. "If you're getting cannabis in the California market right now, you're smoking unquestionably the cleanest cannabis that's ever been smoked by humans," says McKee. "It's over-the-top scrutinized. Everything gets tested so many time, it's almost a little ridiculous."